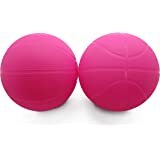 Sold by Knockout Novelties, Inc. and ships from Amazon Fulfillment. 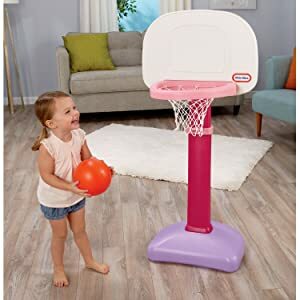 Toddlers will love this adjustable basketball hoop! 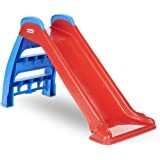 Start at just 21/2 feet and move up to 4 feet. 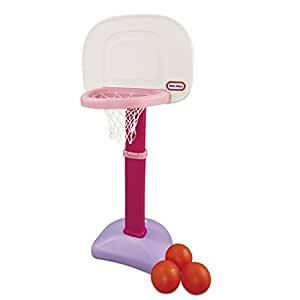 The bright pink hoop is perfect for little girls. 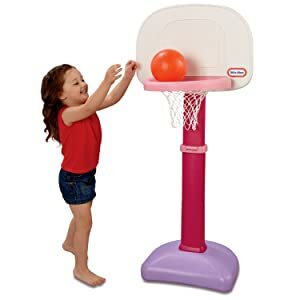 The oversized rim and kid-sized ball let children enjoy a sense of accomplishment. 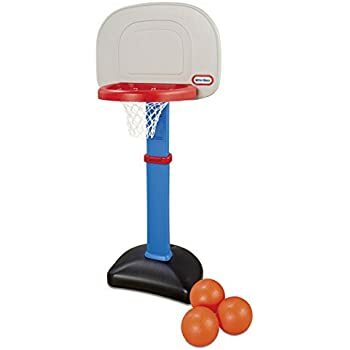 Basketball sets promote active play and introduce competitive play. 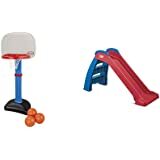 The Little Tikes Easy Score Basketball Set, designed for children 18 months to 5 years old, introduces kids of all abilities to the game of basketball and competitive play. 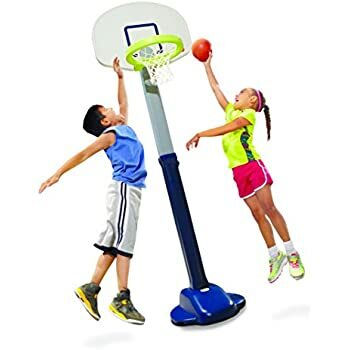 The height can be adjusted to six settings between 2.5 and 4 feet to accommodate even the littlest hoop star. 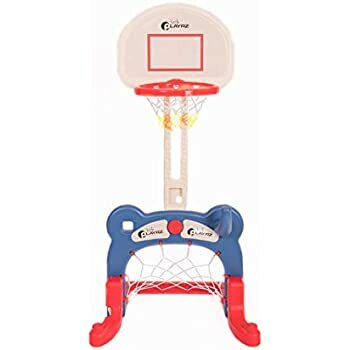 The oversize rim and kid-size basketball ensure easy scoring and help kids develop hand-eye coordination while providing the right challenge level. Before play, add sand to the base for stability. 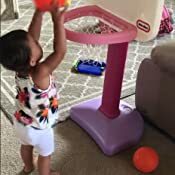 5.0 out of 5 starsMy daughter is on her way to becoming Michael Jordan! I purchased this for my 18-month-old daughter. 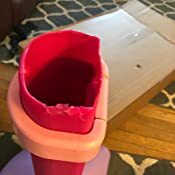 Good: My daughter loves this thing! When I first purchased it, I was not sure if it was going to be something that she would enjoy and use. After the first Harlem Globetrotter style slam dunk, I was wrong. She took to this thing like a pro! Caution: If you do not put water or sand in the base, it tends to tip over. 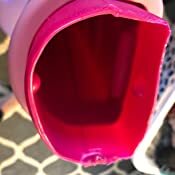 Since we keep it in the house, we have not felt it up with water, so it is something we deal with. Conclusion: Definitely worth the purchase! My daughter uses this all the time and has yet to grow tired of it. 5.0 out of 5 starsLove it ! My toddler loves it ! Great for indoor our outdoor but we keep indoor and just FYI you have to add water or sand to keep the weight of the stand to stay in place or it’ll tip over. For indoor of course sand is what is recommended but other than that I recommend for toddlers. 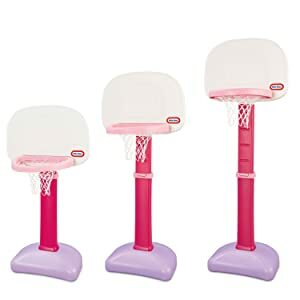 According to the description, the basket height is between 2 and 4 feet. the shortest that is will go is 33 inches! 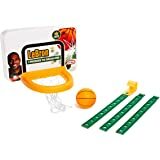 I bought this to teach my Golden Retriever to play basketball (we do demos for kids and elderly!). He cannot reach the hoop (he is 23" at the shoulders) to drop the ball in. He has trick dog titles and this is a fun new trick. I will make an adjustment on the pole, but am disappointed that the description is not accurate. 4.0 out of 5 starsEasy set up. Netting could be better attached. Very easy to set up. It came with 3 balls although one came almost deflated. Seems like it just needs some air. No punctures. My 13 month old niece instantly new what to do. She's a natural! Putting the net on is what took the most time and as I played around with it and was taking shots myself I noticed the net would come undone and I'm positive I placed the net on correctly. So that's the reason for the 4 star rating rather than a 5. Also, it came in a brown box with a description but no picture of what's inside. My 18 month old granddaughter loves it. Quick and Easy to assemble. 5.0 out of 5 starsPerfect for a little indoor fun. I got this for my grandkids. 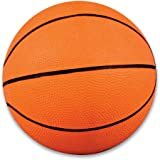 Before I had it they would grab my son’s real basketball and toss it inside of the house making way too much noise. I got them this for Christmas and they loved it. 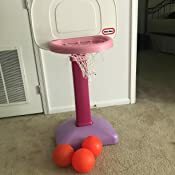 It came with 3 balls and the hoop adjusts to different heights. Very happy with this product. 4.0 out of 5 starsLove this with my toddler! 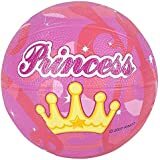 Love this for my daughter! Nice to have the pink option (of which I said I wouldn’t do at first lol). Only received one ball that was slightly smaller than the others. 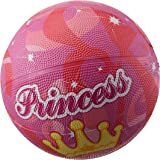 Even the product code on the ball was different than the other two but it serves its purpose.